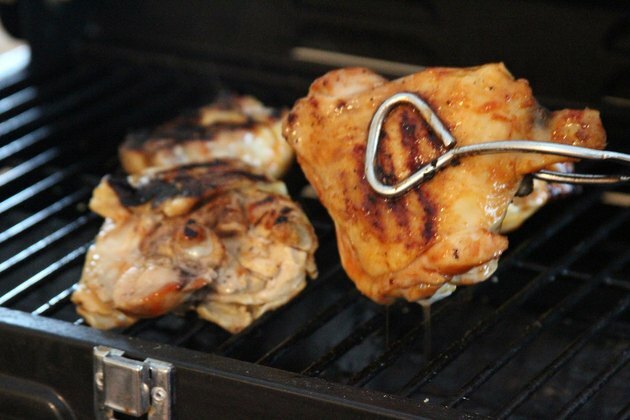 Almost anyone can manage to grill a decent steak or hamburger, but cooking chicken on the barbecue is more problematic. All too often it's overcooked and stringy, or charred on the outside but still raw at the bone. 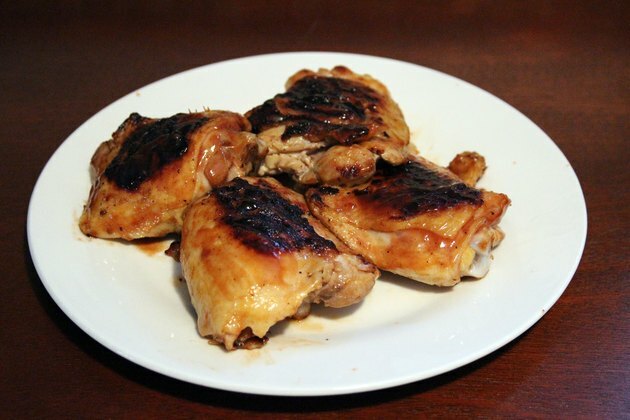 Parboiling the chicken before you grill it simplifies and speeds the process greatly, needing only a few minutes on the grill to yield well-caramelized, juicy chicken pieces. Layer your chicken pieces into a large saucepan, then pour in enough chicken broth or water to cover them. If you're using water, add a teaspoon of salt to gently season the chicken. Bring the pot to a gentle simmer, so the broth or water just barely bubbles. 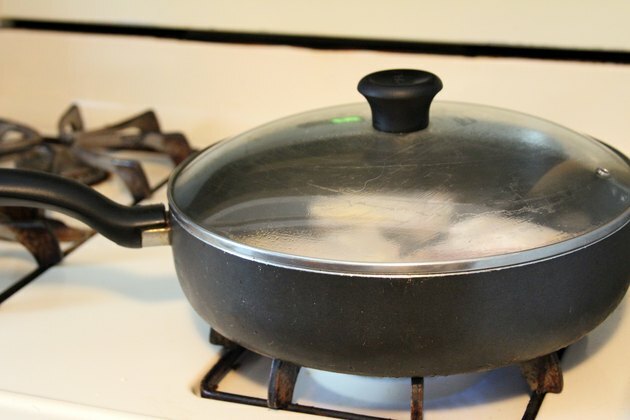 Simmer the chicken pieces for 5 minutes, then remove the the pot from your burner and cover it. Rest the chicken pieces for 10 additional minutes, then drain them thoroughly on brown paper. Season them with salt and pepper, or a dry spice blend of your choice. Preheat your grill to a medium-high temperature, approximately 375 to 400 degrees Fahrenheit. 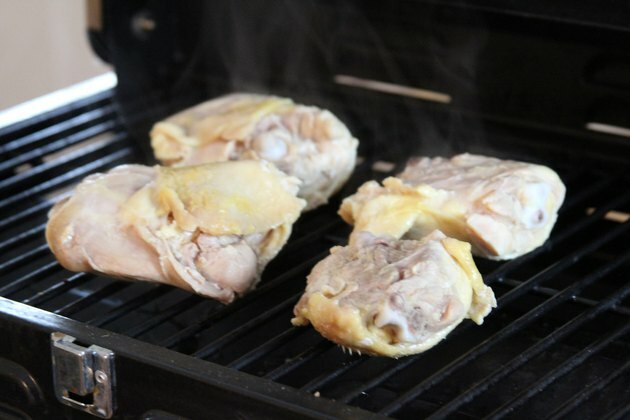 Place the chicken pieces on your grill, skin-side down. Grill for 3 to 5 minutes, until the skin is well marked and begins to crisp. Brush the upper side of your chicken pieces with barbecue sauce, then flip them so the skin side is up. While the second side is cooking, brush the skin side of the pieces with sauce. Turn the chicken pieces after another 5 minutes, so the skin side is down again. Cook for another 2 to 3 minutes, until the sauce is well caramelized. An instant-read thermometer inserted into the thickest part of the chicken should read 160 F. Transfer the chicken pieces to a serving platter, and let them rest for 5 minutes before serving. Old recipes speak of "boiling" the chicken, but this is a misnomer. The chicken should never boil, because boiling makes it tough. At a simmer -- 180 F to 190 F -- the proteins in the chicken pieces won't contract and tighten. 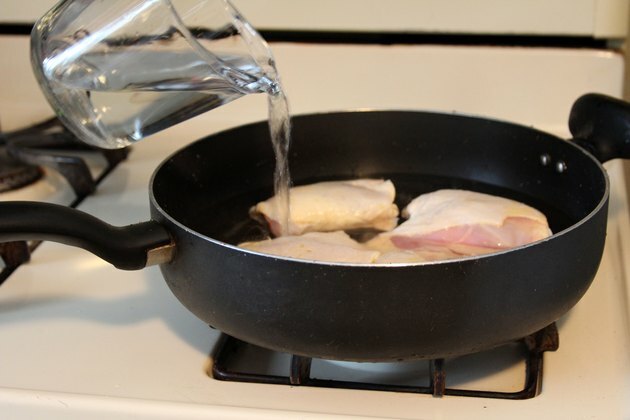 Parboiling the chicken renders out much of the fat, minimizing the risk of flare-ups. It also helps the skin crisp on the grill, a secondary benefit that many diners appreciate. Boneless, skinless breasts and thighs cook quickly enough that they don't need parboiling. 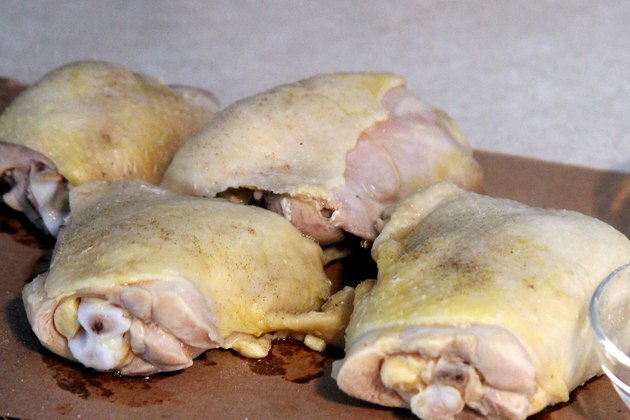 Use this technique with bone-in, skin-on breasts, thighs, drumsticks or leg quarters. Always cook your chicken pieces immediately after parboiling them. Cooling and reheating them later creates an unnecessary risk of foodborne illness.